Hello, kittens! It's nice to see you all. I hope the last year has kept you well. 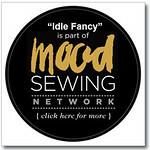 Not going to lie, I've been consistently stalking sewing blogs, even if I haven't been updating my own. Your new dog? Super cute. That dress you just made? Even cuter. Personally, there have been a lot of changes in my life this year. We'll get to some of those big ones a little bit later, but they have meant less time to sew and even less time to photograph the things I've sewn. Things have settled down a bit recently, however, so it seemed time to break back into blogging. 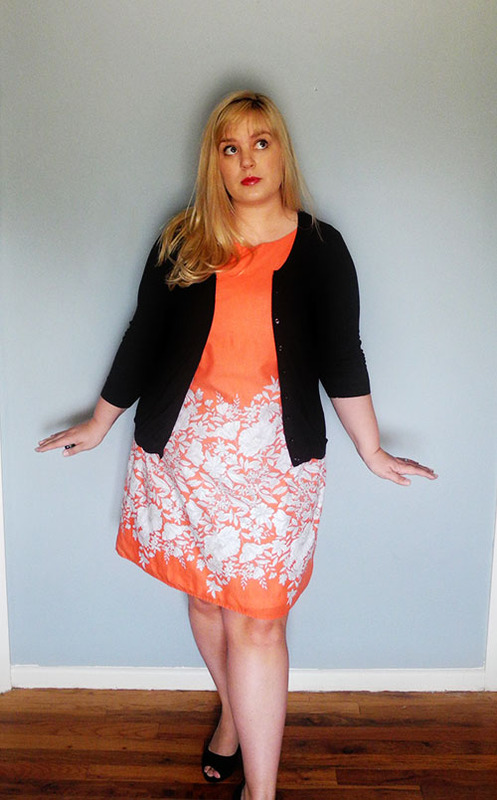 The first project up in my post queue is everyone's favorite sheath dress, Colette's Laurel pattern. I couldn't resist. Laurel seemed the perfect stash-busting pattern. It's super efficient for fabric use—less than two yards required for the sleeveless version—and works great with a border print. So, I made a muslin and ended up loving it. I didn't need a traditional FBA, instead just grading from my high bust size at the top to my actual bust size in the bodice, then nipping in the waist and hip lines. How easy to fit! My first real version was this orange sherbet confection, which uses fabric that has been malingering in my stash for entirely too long. It's a very lightweight cotton voile, with a fabulous wide floral border running the length of the fabric. Laurel worked perfectly to take advantage of that fact, turning into the perfect, classy little sheath dress. It may not be the best pattern for my shape, but not everything in my wardrobe can be poofy skirted fit-and-flare styles. It's just too boring! This Laurel is a comfortable go-to summer cocktail dress, which is always nice to have on hand. Since making this first one, I've whipped up two others in more autumnal fabrics, which will look great with boots and layers of cardigans, once we finally see the end of summer. I really loved the ease of making this pattern. Even with the full linings I put in every dress, they've taken me less than two hours from the first stitch to the hem. No zipper is needed, since they're so roomy, and they're a cinch to assemble. Colette's instructions were, as ever, straight forward and helpful. If you're just starting out in garment sewing, this would be a fantastic pattern to start with—quick, easy, and super cute. My final review: A+, an all-around adorable pattern. Would we expect anything less from Colette? The only last thing I have to document is the reason for my prolonged absence. Mary, where on earth have you been for the last year? Well, lots of great things have been going on. I finally finished one of the two degrees in my dual doctorate program, leaving only my final dissertation project to finish this year. I've moved from Austin, into a lovely little bungalow in a small city 90 miles north. Are you so excited? No? Well, I am excited to tell you! All of this moving about and city changing has occurred, because a little over a year ago I started dating a wonderful man. His name is Sam—Dr. Sam, if we're being official—and he's lovely as you can see below. Not only is he appropriately bearded, but he's incredibly smart, funny, and generally the most delightful person I've ever known. 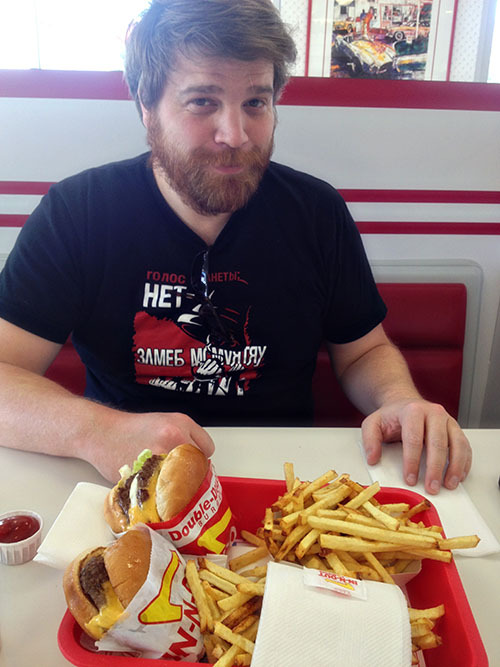 Sam, looking skeptical as I document a rite of passage: his first In-N-Out burger. For Valentine's Day, he bought me all the seasons of Buffy. He is a professor, a Trekkie, and quite attached to his gigantic German Shepherd. He is also the person I'm going to marry this December. 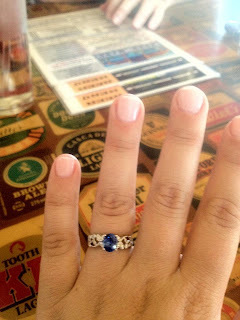 Obligatory ring picture, because it's not an engagement post, without something sparkly. That's right! I'm getting married. It's okay, if you can't believe it. We've been engaged for over six months now and I'm still a little bit in disbelief. I legitimately never thought I'd get married. So much of my life has been focused on career and friends and interests, that I never left much room for what I thought relationships meant. It turns out, you can have all of those things, you just have to find someone who wants to share them. Sam is awesome. We are awesome. I'm beyond thrilled about continuing my life's adventures with him as a partner. That's a lot of mush, readers, I know. This last year has been a whirlwind, both emotionally and professionally, but I am still alive and still sewing. And, after so many delays, still blogging. Thanks for sticking around, friends! Thank you so much, Dibs! The Laurel is definitely worth the buy. I was convinced it would look horrid, as I said, but it's actually so cute all made up. I can't wait to see your version, if you do buy it! I don't think I've ever been so excited to see a blog pop back into the feed! Your dress is gorgeous, and congratulations on happy life stuff! Thanks so much, Map! I'm so relieved that you still have me in your feed, honestly. It's been way too long. Thanks for understanding, Montana! I'm so, so glad to be back, but even more happy that you're still reading. Also, best wishes on your own new marriage and locale! Congrats on everything, chica! Woo hoo! Congrats to you and Dr. Sam. Thanks so much, Mela! I'm so glad you like it. Thank you, Karen! We're so excited about it! this is so great! congratulations and welcome back! Congratulations on both the hot man and the dress! I am so chuffed (English slang for pleased) that you're back! Although I have suspicions that you have an alter ego in blog land, not that I've been stalking you or anything! Awesome use of the border print and massive congrats on the professor, woohoo! Will you be sewing your wedding dress?! Ha! Janey, I think you may have a future as a lady sleuth, if you want one. There *may* be a snarky, former-spinster alter ego of mine out there in blogland. Thanks so much for your congrats, too! And so glad you liked the border print. This pattern was just what that fabric needed. Wow, her dresses are beautiful, makes me want to get married all over again! I hope you post a pic of the dress after the event, would love to see what you went for, sounds dreamy! Thank you so much, Alana! I'm thrilled to be back. Incidentally, you have once again influenced my sewing queue. I hadn't even though to buy the By Hand London Anna pattern, until seeing your recent knit version, and it's laying on my cutting table as we speak. I have my fingers crossed that it will turn out as lovely as yours did! Congratulations! Both Sam and Laurel look great. Being a curvy girl myself I didn't think this dress would work for me, but your post persuaded me to give it a try! Marianne, thank you! I felt precisely the same about this pattern- it just seems tailor-made for wee, lithe ladies. It's turned out to be a really great wardrobe basic for me, though, since it's so easy to layer over, which cuts some of the straight lines of the pattern. Definitely worth a try! Let me know how yours turns out. Congratulations! And so good to see you back. Would it be weird to say I was just thinking about you? In the least creepy way possible, honest. Still sounds weird, doesn't it? I honestly never thought the Laurel would work for me, being on the curvy side myself, but it looks really great layered with a cardigan and cold weather approaches. It might be time to rethink that... Good luck with the impending nuptials and all the planning that goes along with that! Totally not weird or creepy! Thank you for thinking of me, for real. I was a bit worried that I'd start blogging again and all I'd hear were crickets, so thank you, thank you, thank you. Also, as a curvy person, I do think layering is the way to go with this pattern. I feel fine in the dress by itself, especially since it's wretchedly hot here, but it's much more flattering under a cardigan for sure. 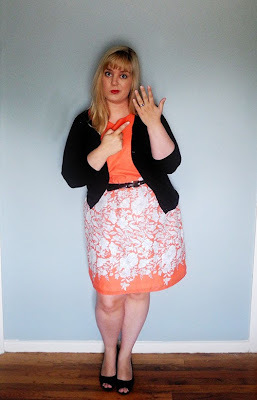 I'd love to see other curvy women try this pattern out, because of that! Welcome back!!! I've often stalked your blog hoping you'd make an appearance...and here you are...woohoo! Congratulations on your engagement too...Dr Sam looks super cute! Oh, and I love your Laurel by the way! Thanks so much, Marie! And I'm so glad you kept popping back in. It's such a relief that people still have me in their feeds. Thank you, thank you! You HAVE been a busy girl. Thanks so much, Nessa! It's been quite the year! Im glad to see your alive and well. Congratulations on your engagement! Congratulations!! And the Laurel is absolutely beautiful! 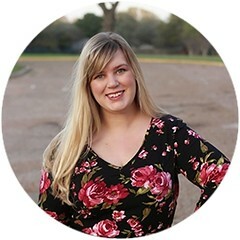 If you ever feel like making the trek back into Austin, or meeting up in Georgetown, I'm a fellow Austin sewer living on the north end of town and would love to chat sewing with you sometime! Also, can we please, oh please, meet up some time? I would absolutely love that. My family still lives in Austin (on the NW side, actually), along with most of my dear friends, so I make the trek back all the time. Maybe we should set up an Emery dress coffee date sometime later this month? I'll shoot you an email about it! I'm dorkily thrilled that you've returned. It seems every time I Google a pattern and am on the fence, your version is the first to pop up. I've donated my Laurel to my waifish mum (the straight silhouette scares me), but now I'm reconsidering. Also, the straight silhouette on the Laurel really is terrifying. It took me a couple of weeks to get comfortable wearing this pattern, without strategic layering. 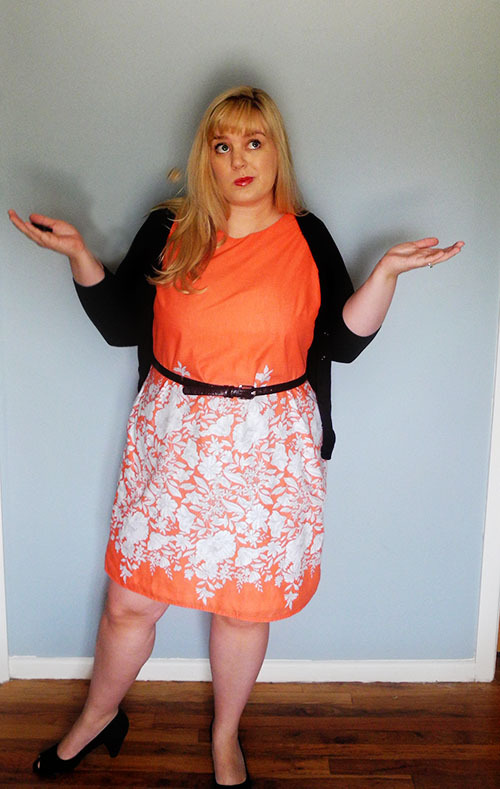 It's so easy to get used to fit-and-flare styles, that wearing a simple column can be both uncomfortable and daunting. Honestly though, I've grown to love the ease of this dress. It's so damn comfortable! I think in the fall/winter, especially, this pattern will work really well under other things. Thank you so much for checking in, L! When I was rebuilding my sewing blog feed list (Google reader going defunct messed with my xi), yours was one of they very first I wanted to catch up with. You sew the most lovely things! Thanks so much, Mel! Congratulations on your own engagement, chica! I was just reading your post about making your own dress, honestly. I am so, so in awe that you're tackling it yourself. When I was briefly considering it my dear family talked me out of it...for the sake of their own sanity, I believe. Yours is going to be amazing! I can't wait to see how your vision comes alive. Thank you so much, Shivani! Thanks so much, Amanda! It's so great to be back! congratulations! fab dress and that fabric - oi vay! it is delish. Thanks, Moira! I'm so glad you like it! Thank you so much, Anna! Honestly, your blog is part of the reason I started to get back into sewing this summer. You make the loveliest, most inspiring pieces! Welcome back, and with such exciting news to share. Congratulations! I missed your beautiful creations, especially when I would sometimes see new pins from you on Pinterest. Your Laurel looks great on you. Congratulations! YIPPEE! And Love your sewing! 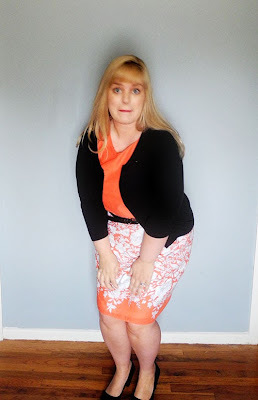 Can I (belatedly) say CONGRATS and so glad you are back to blogging and sewing, I really missed your blog and kept crossing fingers it was something good keeping you away. Big congratulations! And I'm glad to see you have returned to the blogging world =). Also, the dress looks nice! Making me thinking about getting that pattern...I keep flip-flopping between "it'd look terrible" and "well maybe not"
Congrats! A trekkie who knows how to cook with bacon (just add it to everything!) is always good in my book!